World Net Daily 8-21-06 So, I thought a stroll down memory lane would be appropriate. In the mid-1970s, Jimmy Carter, a fine peanut farmer from Plains, Georgia, ran for the highest office in the land and won. Congratulations Jimmy. Jimmy Carter appeared not to be your garden-variety politician and the country welcomed his down-home country approach. Within a year however, the welcome wore off. Carter's legacy is now inextricably linked to the ''Misery Index.'' No president in the history of the country had a Misery Index as high as Jimmy Carter's. Carter had an average Index of 16.27 percent during his term (1977-80). When he finally left Washington in 1980 is was at an all-time high of 21.98 percent. Not a record I would be proud of if I were you Jimmy. Worse, Wallace followed up his interview with comments of his own, in which he characterized the Islamofascist as "rational," "intelligent" and "very attractive." Ever hear him or his liberal colleagues describe President Bush in such glowing terms? AJC 7-28-06 On Young’s endorsement of Cynthia McKinney -- Johnson dismissed Young's endorsement, saying, "Nothing that Andy Young does surprises me anymore. The ultimate endorsement will come from the voters on Aug. 8." ……..
We all say things sometime that we wish we could take back. When it comes to Jimmy Carter, it seems to be an overwhelming drive to be “in the news” and grab sensational headlines. He is following the tradition of Ramsey Clark who was Attorney General in the Johnson Administration and was the son of Supreme Court Justice Tom Clark who, I believe, was appointed by Harry Truman. Jimmy Carter has become a disgrace and I am ashamed of him. 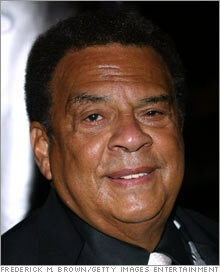 Andrew Young has done some Dumb things lately too. His endorsement of Cynthia McKinney was odd and then his Wal-Mart remarks. Mike Wallace does and says some things that diminish his long career. His interview of the Iranian President has been roundly criticized. On Wallace, a media person who has heard the tape, says he did ask some hard questions. If so, I can only assume the media anti-Bush attitude highlighted the Bush Criticism. All three of these men are past their prime. It is time for family members to try to intervene and put a muzzle on them. Carter and Wallace are long overdue. Andy Young is definitely on the decline. LAS VEGAS (AP) - Democratic Senate candidate Jack Carter, son of former President Jimmy Carter, says he doesn't agree with his dad's criticism of Israel's bombing in Lebanon. "I do not share that view," Carter said in statement released Friday by his campaign. The release followed Jimmy Carter's comments in the German newspaper Der Spiegel. The former president told the paper he did not believe Israel had "any legal or moral justification for their massive bombing of the entire nation of Lebanon." President Carter's comments have been widely criticized by conservative columnists and TV hosts. "Simply put, this is an issue on which my father and I agree to disagree," Jack Carter's statement said. "Israel has every right to defend itself from the terrorists who seek to destroy her, and those who choose to harbor such terrorists." "Israel is fighting for her life; she cannot lose." Carter won the Democratic nomination Tuesday to challenge Nevada's incumbent Republican Sen. John Ensign in November. It will be the Las Vegas investment consultant's first bid for public office. In any other time, with any other president, this would have been unheard of, but not from the new voices coming from the Bush-haters in the Democratic Party. Al Gore does it. Howard Dean does it. Maxine Waters does it. But that doesn't make it right. Jimmy Carter has allowed partisan attacks to escalate to dangerous levels. So, I thought a stroll down memory lane would be appropriate. In the mid-1970s, Jimmy Carter, a fine peanut farmer from Plains, Georgia, ran for the highest office in the land and won. Congratulations Jimmy. Jimmy Carter appeared not to be your garden-variety politician and the country welcomed his down-home country approach. Within a year however, the welcome wore off. Carter's legacy is now inextricably linked to the ''Misery Index.'' No president in the history of the country had a Misery Index as high as Jimmy Carter's. Carter had an average Index of 16.27 percent during his term (1977-80). Of course, who could forget the 444 days America was held hostage by Iran? The now-famous program, ABC's Nightline, was birthed to cover the day-to-day events. Each night we would watch the news, counting the days our captured Americans were being held by radical Islamic terrorists while President Jimmy Carter sat by powerless and did nothing. The appeaser didn't want to upset the Ayatollah Khomeini. The leader of the free world had been reduced to a thumb-sucking peacenik by a gang of 7th-century hoodlums. Suffice it to say, the Carter years were very bad for our nation. 16 percent inflation, 22 percent interest rates, and 70 percent marginal tax rates did little to endear Jimmy to the hard working people he claims to now protect against George W. Bush. Today, under Bush, we have 2.7 percent core inflation rates, historically low interest rates and 35 percent marginal tax rates. Looks like Jimmy is jealous. I have to stop myself from going any further, for if Carter's own words are not enough to show his stupidity and hatred for our country and the president then nothing will. Jimmy Carter has done more than any single president to hurt this nation, not only while in office, but even more so since he was booted from office in complete humiliation. The American people rejected him and his insane policies. We in America couldn't get rid of this guy quick enough. His anger toward the country and its current leader is no surprise given how soundly he was rejected. He needs therapy to heal, not worldwide attention. Carter is the first former president I can think of who has openly attacked a sitting president. Carter should thank his lucky stars Nixon, Ford and Reagan were men of character, for if they operated like Carter and Gore he would have been under an attack that would have made his head spin. And he would have actually deserved it. Make no mistake about it. Jimmy Carter is not an American citizen. He is a citizen of the world. His views are so misguided that he would be relegated to a spot next to Michael Moore or Cindy Sheehan had he not been president of the United States. My God in heaven, what were we thinking at the time to elect a nut case like this in the first place? Maybe Der Spiegel should have departed from the Bush-bashing questions and asked real questions of Jimmy, like what about the alleged million dollar contribution from the bin Laden family to your library? Or perhaps digging into his involvement with Saddam Hussein and the ''oil for food'' scam? What about accepting the Nobel Peace Prize knowing it was bestowed upon him by liberal …..
Look, I am not the biggest fan of George W. Bush and I think he has made some serious mistakes. I am, however, a big fan of my country. I believe in America and its goodness. I believe in the American people who make it work. So when I see an ex-president who is not qualified to run a five and dime offer his opinion to the world abouthow it is worse off due to the United States, it p - - - - - me off. Jimmy Carter and Mike Wallace are shining examples of why forced retirement makes sense for anyone over the age of 80. Obviously, at that point in life, if you have experienced rejection, you become rather bitter. And while you are entitled to be bitter, it should not be at the expense of good, honest, hardworking folks who believe in their nation. So Jimmy, don't go away mad. Just go away. Is this guy serious? Militants take one or two soldiers? This guy needs meds, a straightjacket and a rubber room ASAP. Israel was attacked by Hezbollah, Jimmy. A terrorist organization. They came across a sovereign border and killed eight Israelis soldiers and kidnapped two others. …… Terrorists who have killed innocent people. I guess in Jimmy's world one man's terrorist is another man's militant. This guy is dangerous. Talk about immoral thinking. Apparently that type of thinking comes from the Carter Center. America bad. Israel Bad. Militant good. He talks about how he was troubled by the celebrations of Cuban exiles in Miami on the news of Castro's illness. Of course, he has no problem with the Arab world rejoicing in the streets when 3,000 innocent Americans died on Sept. 11. Of course not! ……. If fighting terrorism and taking a stand against radical Islamic terrorists who kill their own children, fellow Muslims, innocent Americans (241 dead Marines in Beirut and 3,000 on Sept. 11), and Israelis means standing alone, then I am proud to be on the side that stands alone. ….. So again in closing, please Jimmy, just go away. Build nice houses for people, but leave the critical thinking to those who have a brain. CBS has a long tradition of not just interviewing dictators, but humanizing them and providing a global propaganda platform to spew their hatred and twisted ideologies. This tradition was on view again with Mike Wallace's softball interview of Iran's Nazi-like President Mahmoud Ahmadinejad in a 60 Minutes segment Sunday. The 88-year-old Wallace came out of retirement for the Ahmadinejad interview. A big mistake. His long-standing reputation for being a "tough questioner" went the same way as Dan Rather's news credibility after trying to bring down George W. Bush's presidency with fake documents. Wallace touched on some hard issues here and there, such as Ahmadinejad's repeated calls to wipe Israel off the map and his Holocaust denials. But Iran's highest-ranking public official evaded the questions and Wallace let him get away with it. His questioning wasn't only deferential and respectful - neither of which Ahmadinejad is entitled - it was kowtowing and cowardly. Wallace came off like those liberal TV anchors interviewing Hillary Clinton - never ask tough questions unless it's unavoidable, and then let her off the hook with evasive answers. The Ahmadinejad interview was neither enlightening nor informative. Wallace's softballs brought out none of the man's innate hatred, his lies about his nation's nuclear intentions, his Nazi-like racism, or his commitment to genocide against Jews and "infidels." Ahamdinejad is a truly evil man, but under Wallace's questioning he came off as just another "reasonable critic" of U.S. and Israeli "oppressive" foreign policy. Wallace needs to go back into retirement - and stay there. N Y Times 8-18-06 …..His remarks drew forceful condemnation from Arab, Jewish and Asian leaders. AJC 7-28-06 On endorsement of Cynthia McKinney -- Johnson dismissed Young's endorsement, saying, "Nothing that Andy Young does surprises me anymore. The ultimate endorsement will come from the voters on Aug. 8." ……..
Move comes as civil rights icon apologizes for having said immigrant-run shops 'rip off' blacks. NEW YORK (Reuters) -- Civil rights leader Andrew Young resigned as chairman of a group intended to boost Wal-Mart Stores Inc.'s image after he made remarks to a newspaper disparaging Jewish, Arab and Korean shop owners. Young told the Los Angeles Sentinel, an African-American newspaper, that Jewish, Arab and Korean shop owners had "ripped off" urban communities for years, "selling us stale bread, and bad meat and wilted vegetables," The New York Times said. In a statement posted on the Working Families for Wal-Mart Web site on Thursday, Young apologized for his remarks and asked for forgiveness from those whom he offended………. In a statement Friday, Wal-Mart said Young's comments "do not represent our feelings toward the Jewish, Asian or Arab communities or any diverse community. Needless to say, we were outraged when the comments came to our attention. We were also dismayed that they would come from someone who has worked so hard for so many years for equal rights in this country." "Ambassador Young has done the right thing to apologize and to ask for a retraction. We also support his decision to resign from the post of chairman of Working Families for Wal-Mart," the statement went on to say. WASHINGTON, Aug. 18 /U.S. Newswire/ -- Today, the chair of Wal-Mart's front group, Ambassador Andy Young, was forced to resign because of racist statements he made about Jews, Asians and Arabs in defense of Wal-Mart. Ambassador Andy Young's statements about Jewish-Americans, Arab-Americans, and Korean-Americans are outrageous and incredibly hurtful to countless Americans. As a former civil rights leader and public spokesperson for Wal-Mart, it is even more shocking that he would use this hateful demagoguery to defend Wal-Mart's business practices which put so many small "Mom and Pop" businesses out of business. While Ambassador Young has now resigned as chair of Working Families for Wal-Mart, a front group established and directly financed by Wal-Mart, these hateful statements only serve to raise more serious questions about the recent attacks this same group has volleyed against some of America's great leaders. In just the last week, Wal-Mart has needlessly used an army of right wing operatives, under the name Working Families for Wal- Mart, to attack countless Democratic leaders who have stood up and called on Wal-Mart to become a responsible and moral company. We hope in the aftermath of Ambassador Andy Young's resignation, Wal-Mart will immediately shut down this pointless attack group, end its association with the cadre of right-wing operatives it currently employs, cast aside its misguided political threats against so many Democratic leaders, and realize that only through real positive change will Wal-Mart become a better company. “The sad part,” he said, is that “even people of color and even minorities who suffered discrimination and prejudice are not immune from being bigoted and racist and even anti-Semitic.” ……………. Jimmy Carter – What a Loser!! Being too pro-American is a bad thing ... at least according to Jimmy Carter. The former president ripped British Prime Minister Tony Blair, saying his lack of leadership and timid subservience to President Bush lie behind the ongoing crisis in Iraq and the worldwide threat of terrorism. "I have been surprised and extremely disappointed by Tony Blair's behavior," Carter told Britain's Sunday Telegraph newspaper. "I think that more than any other person in the world, the prime minister could have had a moderating influence on Washington - and he has not. I really thought that Tony Blair, who I know personally to some degree, would be a constraint on President Bush's policies towards Iraq." In the exclusive interview with the Telegraph, Carter made it plain that he sees Blair's lack of leadership as being a key factor in the present crisis in Iraq, which followed the 2003 invasion - a pre-emptive move he said he would never have considered himself as president. Carter also said that the Iraq invasion had subverted the fight against terrorism and instead strengthened al-Qaida and the recruitment of terrorists. …….